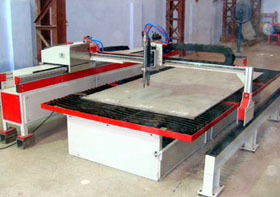 AutoKut from SEC is gantry type robust CNC profile cutting machine. It has a rugged gantry design for optimum performance in a wide range of processes including OxyFuel as well as for Plasma Cutting. SEC provides choice and options that allow you to configure a gantry system with capacity and options you need for your applications. It combines powerful performance with multiple torch carriage flexibility to deliver high productivity of ultra accurate shapes such as circles, rectangles, stars, hexagons or any shape your creativity can conquer. The cut quality and accuracy are dependent on smooth precise motion control on both the axes. You get the best when you choose SEC,s AutoKut CNC Plasma Cutting Machine. AutoKut has Heavy duty precision machined caged ball Linear Bearing Guides supplied for long life and vibration free very precision motion movement. The Gas Control System is designed for efficient and safe gas control. 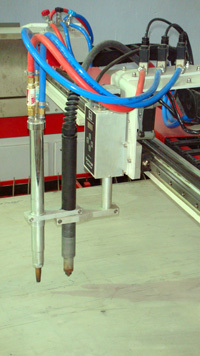 The gas panel is mounted on the machine for easy operation. Hi-Lo preheat control is provided as standard. Cutting Oxygen vent-off valve is provided for safety. are available to use with standard and high-speed nozzles. Plasma cutting possible .The machine is plasma ready. Various plasma equipment options are available for individual needs. The machine can also be supplied with Arc Voltage Height Controller. 1 The Machine is the blend of best of PC and PLC Control Technology. The Software Runs on PC and the Machine runs on PLC. The Software generates G Codes which is taken in a USB pen and transferred to Machine where the PLC controller displays the drawing and does the cutting operation…. due to this the machine is always safe from viruses and windows crashes and registry problems…. This is the major issue in a PC based run machine controller. The Machine runs on just 1 Phase 230V 50Hzs and consumes hardly 3.5 Amps. It has inbuilt Earth Leakage Circuit Breaker , Overload Circuit Breaker , Voltage Stabilizer , Uninterrupted Power Supply and All Shut Emergency Switch. In event of Emergency Shut Off or Power Failure the Machine can start from the same point where it stopped and can even be jogged back and front on the line of cut. 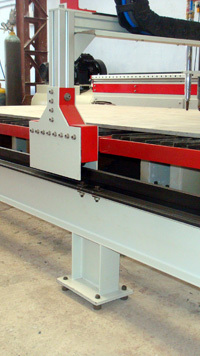 5 Lesser Chance of Breakdown than any other CNC Machine. AutoCut does not run Windows PC , no viruses , no registry errors , no adwares , no malwares , no missing files due to softwares deletion and no pirated softwares problems … major breakdowns of CNC Machines are due to the above mentioned factors only. AutoCut has inbuilt Electronic Gearing calibration system , this enables any mechanical errors to be corrected digitally . AutoCut is very accurate and gives reliable superior accuracy years after years and this feature is possible due its Unque unmatched Electronic Gearing Technology. 15 Months on Site Warranty even for the Electrical Components 3 years Warranty for Hypertherm Plasma Power Source India’s Best Elgi fully Guaranteed Air Compressor. Due to World Renowned Automatic True Shape Nesting Software from Germany. Comes with World Famous Japanese Divergent High Speed NM Oxy Fuel Technology Ultra Safe due Nozzle Mix System … no more backfires in Torch and Hoses The Nozzles last 5 times longer and gives very good cut quality. 10 Backed by 20years of your Local Experience and Credibility. SEC is more than 20 years in Cutting Machines Manufacturing and has large List of Satisfied Customers and its list consist of customers like L&T , Thermax . Railways and Govt Departments. Beam Industrial Ultra Staright and Robust Aluminium Extrude Section. Drive system Rack and Pinion with Electronic Correction Facility. CNC Industrial Grade Arm Chip PLC Controller. Machine Controller Carriage 1 Set. IBE Nesting Software 1 No. Torch Height Controller 1 No. Flash Back Arrestors 5 Nos. XY Table unit 1 Set. Plate Keeping Table 1 Set. Hose Pipes and Cables 1 Set.